I recently spent a weekend in Bath and had the most wonderful time. Bath is internationally renowned for its breathtaking beauty, from its unique Georgian architecture built from distinctive honey coloured ‘Bath stone’ to its incredible natural hot springs. I’d always wanted to visit Bath so when I had a weekend free I decided to take the plunge and make the journey from London to the southwest of England. Here is how I spent a weekend soaking up the wonders and foodie delights that Bath has to offer. We made the journey by car and arrived at our hotel at 2pm, however Bath is easily accessible by direct train from London Paddington and takes around 90 minutes. If you are travelling by car there are several car parks in the centre where you can park your car for 24 hours with no max stay. We parked at Southgate car park and the cost for 26 hours was around £15. 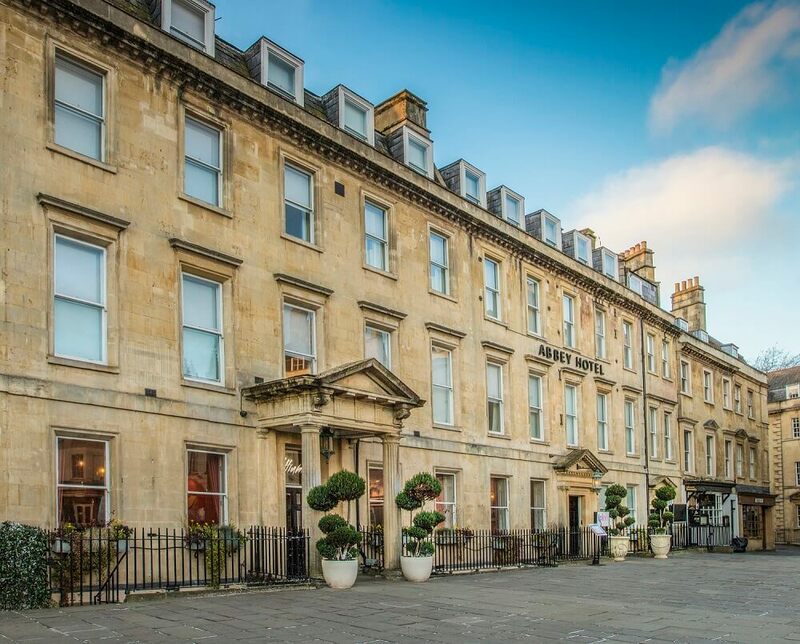 As we only had a short time in Bath, we wanted to stay in a hotel that was in the heart of the city and a convenient walk away from the main attractions. The 4 star Abbey Hotel is perfect as it’s literally a minutes’ walk away from the Roman Baths and Bath Abbey. This boutique hotel is independently owned and has a quirky Artbar and the highly acclaimed Kaufmann & Mr White’s restaurant, where we were excited to dine later in the day. We stayed in a room facing the city that had a lovely view of Bath. The room itself was big with lots of light coming in and the bed was kingsize, which I always love when sleeping in a hotel. The bathroom was sleek and modern complete with a rainforest shower (which is always a win with me!) and complimentary luxury toiletries. We checked in, left our bags in the room and went straight back out to make the most of our time. Although there are tourists from around the world in Bath, the streets aren’t crowded like in central London. This is great as you can take your time walking through the labyrinth of cobbled streets to gaze at the marvellous Georgian architecture and wander into the quirky shops offering artisan food, fabulous handmade jewellery and art, and antiques. We soon found ourselves in front of the majestic Bath Abbey and were mesmerized by the intricate architecture and the sheer presence of the church. Bath Abbey is the last of the great medieval churches in England and over the past twelve and a half centuries two other churches have occupied the site dating from 757. Unfortunately for us, there was staff training taking place in the church so we couldn’t go in but seeing the Abbey up front was certainly a highlight of the trip and I can still remember the intricate carvings in the beautiful yellow Bath stone. A stone’s throw away from Bath Abbey is the Roman Baths, Britain’s only hot spring and where the Romans’ built a magnificent temple and bathing complex that still flows with natural hot water. Lucky for us, there wasn’t much of a queue for tickets so we were able to get in and enjoy the Baths quite quickly. Ticket prices vary depending on when you visit but it’s definitely worth looking online before you book as there are discounted tickets and you can also save 10% when you book online. Once you are in, there are invaluable audio guides available for free in twelve languages, with one especially for kids, one for people of all ages and another by author Bill Bryson commenting on the Roman site. The Baths themselves are a must-see and it is easy to see why it is one of the most popular tourist attractions in the UK with over 1 million visitors a year. The unique thermal springs are incredible to see and even more outstanding once you hear about the rich history behind them. I was overall very impressed with the Baths and the 90 minutes we were inside just flew by. After the Baths, we opted to see more of the beautiful architecture and historic landmarks of the city. Our first stop was The Circus, a masterpiece by architect John Wood the Elder and one of the main reasons why Bath was awarded the title of World Heritage Site by UNESCO. Walking past the Circus, we made our way to The Royal Crescent, designed by John Wood the Younger between 1767 and 1775. Essentially, The Royal Crescent is a row of 30 townhouses carved out of Bath stone and formed in a crescent shape, as the name suggests. It is quite beautiful to marvel at, especially as the sun begins to set on it to give it a golden hue. After a casual stroll through the winding alleys back to our hotel, we donned our dinner wear and made our way to the hotel’s restaurant on the ground floor, the highly acclaimed Koffmann & Mr White’s. This is the first venture between legendary chefs Pierre Koffmann and Marco Pierre White so I was very excited to see what the French/English brasserie had to offer. The restaurant itself has an understated Parisian charm to it, dimly lit with tall candles on each of the small oak tables and soft jazz music playing in the background. Our waiter was friendly and enthusiastic with clear pride and passion for working in the newly opened restaurant. She informed us that the new menu was made from the freshest ingredients and local produce with influences from cheesemaker and former Blur bassist Alex James and Bath-based baker Richard Bertinet. We started with the recommended dishes of classic French Onion Soup with cider, croutons, gruyère and half dozen snails à la bourguignonne with a side of Richard Bertinet’s sourdough with butter. The onion soup was rich with the taste of sweet onion and was a very large portion for a start. The snails were exactly how you’d expect them, swimming in melted butter and cooked with heaps of garlic and herbs. This was my partner’s first time trying snails and he thought there was far too much butter and garlic which ultimately drowned the flavour of the snail and sadly I’d have to agree. Snails à la bourguignonne is of course supposed to be decadent and rich but it did feel like you were eating what could have been a button mushroom swimming in grease. For our mains, I opted for the confit leg of duck with braised lentils and a sherry sauce and my partner chose the poulet noir, grand-mère, which was Marco Pierre White’s grandmother’s recipe! Poulet noir is essentially a black legged free range chicken known for its succulent and juicy flavour. This is exactly how the chicken tasted and it was certainly the best tasting chicken I’ve had in quite some time. The meaty sweet sauce that the chicken was glazed with was delightful and I only wish there was more of it on the plate! Grand-mère would be very proud of Mr White. The confit leg of duck was also quite exquisite and cook to perfection with a delicately crisp skin. Again I wish there was more of the sauce which was rich with the sweet taste of sherry and perfect with the duck. If I was impressed with the mains I was about to be bowled over by the dessert. 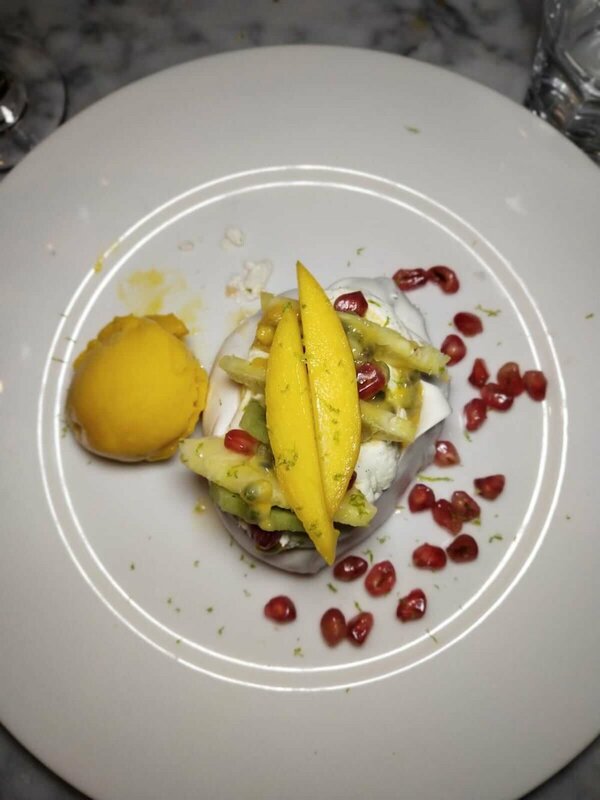 I absolutely love meringue so I of course had to go for exotic fruit meringue with mango sorbet. It was a dream dessert, the meringue was perfect - soft, crunchy and gooey - and the lashings of whipped cream topped with vibrant fresh fruit really made me a happy bunny. The mango sorbet was nice too but it really wasn’t needed when there’s meringue to be had! My partner went for the French gastronomic classic pain perdu, most commonly known as French toast. Again it was an impressive dessert, the buttery brioche somehow remained gloriously crisp even though it was soaked in a lovely vanilla custard. A simple sprinkling of toasted pistachios really did help to cut through the luxuriance of the brioche and custard. My only bugbear is that I wished the dessert was warm instead of cold to make it a perfect remedy for a cold Winter’s night. But having said that, both desserts left us very satisfied! Overall Koffmann & Mr White’s is highly recommended for a decadent meal in Bath. With a very reasonable set menu this a place that foodies on any budget can visit. After a quick stroll to work off some of the rich food, we headed upstairs to our room to sleep off the rest! The kingsize bed was soft and comfy with fluffy pillows to rest our tired heads after a productive day. 8AM - Stock up on a hearty breakfast! The next morning, we were well rested after a great night’s sleep and woke up bright and early to make the most of our few hours left in Bath before we had to drive back. The rainforest shower was fabulous and put me in a great mood for the complimentary breakfast. We were really impressed with the breakfast selection, composing for a cooked meal ordered from the menu, and a buffet of cereals, breads, fruit and yogurts. We tried the full breakfast and the vegetarian breakfast, both of which were delicious and of a decent portion size, enough to get us through the morning exploring Bath! We set off to visit Bath’s first museum, The Holburne Museum, named after Sir William Holburne (1793-1874) who left his vast collection of art and prized possessions to the city of Bath for everyone to enjoy. To get there, we crossed the River Avon via the famous Pulteney Bridge, the only historic bridge, apart from the Ponte Vecchio in Florence, to have shops built into it. Famously, it was the scene of Javert's suicide in the 2012 film version of Les Misérables. The Museum itself is housed in a beautiful 18th century building and is in front of the equally beautiful Sydney Pleasure Gardens, the only survivor of several Georgian pleasure gardens in Bath. It was lovely walking around the museum and seeing the incredible collection amassed by William Holburne, from various intricate oil paintings and portraits by Bath’s greatest artist, Thomas Gainsborough, to antiquities like the stunning Witcombe Cabinet, pictured above. Exhibitions are held regularly in the Museum so it’s definitely worth checking online before you decide to visit to see what’s on as we sadly missed the Auguste Rodin exhibition by one day. After the Museum, we wanted a little retail therapy so we headed to Guildhall Market, opposite Pulteney Bridge. Bath Guildhall Market is the oldest shopping venue in the city, with trading take place on the site for over 800 years, and today a spirited group of 20 or so stallholders continue to trade. 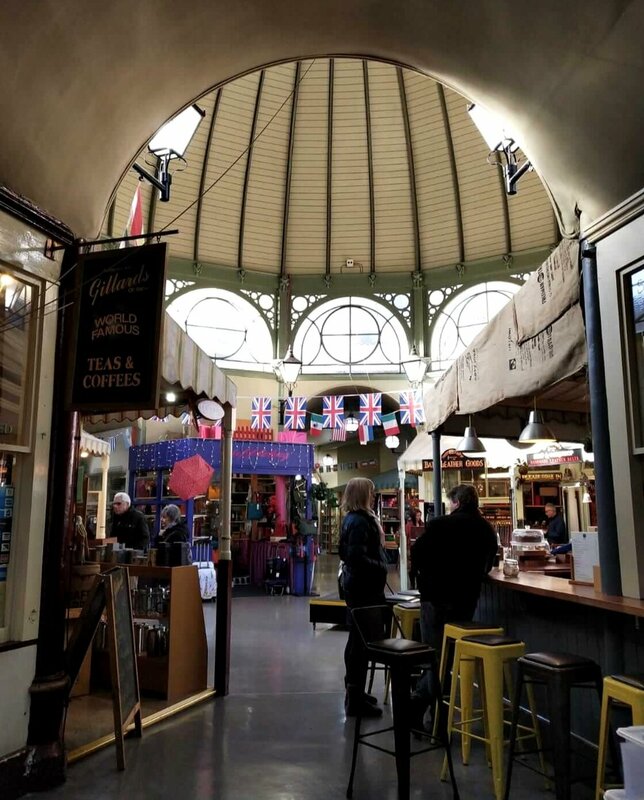 The Market is well worth passing through to see the building and the beautiful domed ceiling, although the stalls themselves aren’t all that impressive. 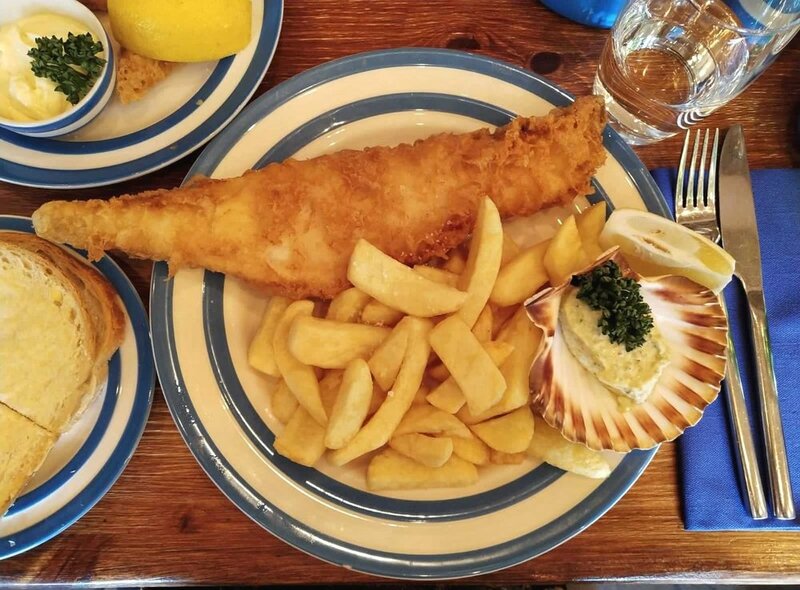 Our trip to Bath was sadly coming to an end but we couldn’t leave without trying one of the best fish and chip restaurants in the country, Scallop Shell. The restaurants has won numerous culinary awards since opening in 2015 and is also known as Marco Pierre White’s “favourite restaurant in all of Wiltshire and Somerset.” As soon as we got inside and saw the nautical decor and furnishings it almost felt like we were by the seaside, definitely a great start! Along with prime cod and haddock, the menu is filled with fresh sustainable catch from UK waters including the likes of prawns, scallops, mussels, Dorset crab and oysters as well as mackerel, whiting, gurnard, sole, sea bream, plaice, skate, hake and megrim sole. I decided to go for the prime haddock fillet with chips and tartare sauce and my partner opted for the fisherman’s lunch - prime battered cod with bread and butter, mushy peas, tartare sauce and a mug of Yorkshire tea for just £10 per person. This was certainly great value for money and judging by the number of mugs of tea around it was proving very popular! Both fishes were fried to perfection in a batter that had the perfect consistency without being overly greasy and the flakes of fish just melted in the mouth. The chips were also plentiful and tasted great dunked into the freshly made tartare sauce. We also ordered a side of Cod Goujons with aioli which can only be described as crunchy little bites of heaven. I really enjoyed my weekend break in Bath as it is such a beautiful city to explore. It is the perfect size to walk around and absorb many of the highlights over two days. There is also an established foodie scene in Bath which is growing by the day! I’ll certainly be back to explore more this gorgeous city has to offer! Have you visited Bath? Let me know if you have discovered any other places worth exploring in the comments below! Special thanks to Visit Bath for their hospitality!